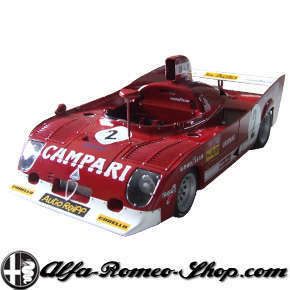 Autoart’s Alfa Romeo Tipo 33 TT 12 that raced the 1.000 km at Spa Francorchamps in 1975 is now available in scale 1:18 in our shop. The race was actually the 750 km at Spa because it was shortened due to rain. This car was piloted by Henri Pescarolo and Derek Bell. The second Autodelta built 33 TT 12 entered by the Willy Kauhse Racing Team (WKRT) was driven by Arturo Merzario and Jacky Ickx and finished 2nd. Alfa Romeo won the world championship in 1975. 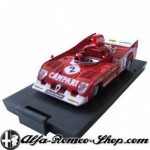 Alfa Romeo Tipo 33 TT 12, driven by Henri Pescarolo and Derek Bell at Spa Francorchamps in 1975. SKU: AA87503. Category: Autodelta. Tags: 1:18, 33 TT 12, Autodelta, Autoart. Alfa Romeo Tipo 33 TT 12, driven by Merzario and Lafitte at Monza in 1975. 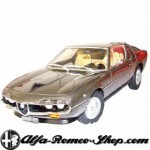 ‹ Alfa 159 SW on sale!